Chinese Aloe or Barbados Aloe grows wild in tropical climates around the world and is cultivated for agricultural and medicinal uses. 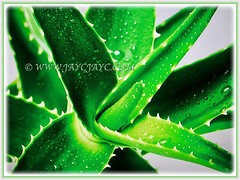 Because of its common use in treating burns and wounds, it is also called Burn Aloe, First Aid Plant and Medicinal Aloe. 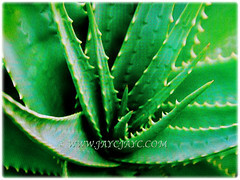 Botanical Name: Aloe vera (syn. : Aloe chinensis, Aloe elongata, Aloe flava). 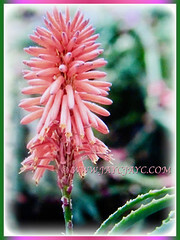 Common Names: Chinese/Indian Aloe, True Aloe, Barbados Aloe, Burn/Medicinal Aloe, First Aid Plant. Etymology: The genus Aloe is the name of a group of shrubs or herbs with spiky flowers and thick leaves, yielding bitter juice which was used as a purgative drug. The specific epithet vera means true or genuine. Origin: Native to Northern Africa. It is widely cultivated elsewhere around the world. 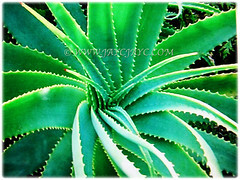 Features: Aloe vera is from the genus Aloe that comprises of over 500 species of flowering succulent plants. A succulent herb and stemless or very short-stemmed plant that typically grows up to 0.3-0.6 m tall but sometimes reaching 1.2 m in height. Fleshy, thick and triangular leaves up to 0.9 m long are arranged in a rosette. 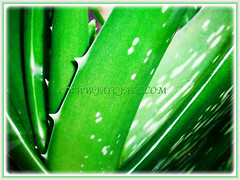 Green to grey-green leaves with white specks on their upper and lower stem surfaces. The margin of the leaves are serrated and have small white teeth. The bisexual flowers are produced on a spike up to 90 cm tall, soaring above the beautiful rosettes of leaves. Each flower being pendulous with yellow, pink and orange tubular corolla 2-3 cm long. Like other Aloe species, Aloe vera forms arbuscular mycorrhiza, a symbiosis that allows the plant better access to mineral nutrients in soil. 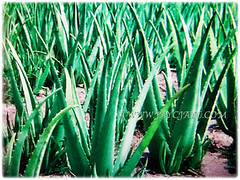 Culture (Care): Aloe vera or Barbados Aloe grows easily with least maintenance. Light: Grows best under direct sun. Nevertheless, it tolerates light shade. Moisture: Minimum water requirements. Since the plant stores water in its leaves, it’s very drought-tolerant for short periods. Soil: Porous and well-drained soils. Others: It grows well in pots that are sheltered from the rain. Remove the spent flower stalks once all petals have dropped. It loves to be pot-bound, so only transplant potted specimen every 2 years to freshen the soil and aerate the roots. Once monthly, feed this plant with a balanced liquid fertiliser for foliage plants to stimulate growth. Generally free from serious pests and diseases. However, it is susceptible to fungal disease, so try to keep the leaves dry and soil from splashing on the leaves. 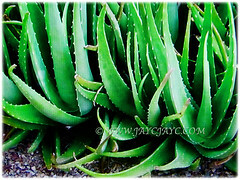 Aloe vera or Barbados Aloe is a tropical or subtropical native and grows well in USDA zones 8-11. Some varieties of Aloe have a cold tolerance of below 0°C with a bit of protection. Plant it in a container in summer but bring indoors to overwinter as a houseplant in a sunny location. If your potted plant is outside when the first fall frost hits, it’ll soon wither and die. In non-hardy regions, grow it in the conservatory or greenhouse with sufficient light. Propagation: Easily propagated by suckers which are produced in abundance. When they are about 5 cm tall, they can be easily separated from the main plant and replanted as new plants. Alternatively, cut off an overlong stalk and just plant it in a pot and it’ll root readily. 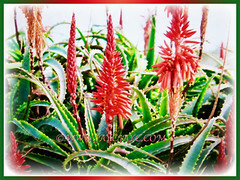 Usage: Aloe vera or Barbados Aloe is an excellent for container planting or grown on the ground. Suitable as an indoor plant. Its leaves contain a clear and tasteless tissue which is chopped and added raw to beverages and desserts for its jelly-like consistence. 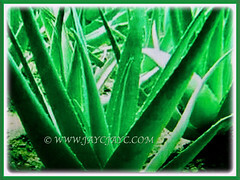 The bitter, outer green layer of the leaf should be peeled away before consuming the inner flesh which is known as aloe vera gel. 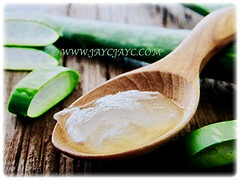 Its leaves contain the clear gel that is applied to minor cuts, burns and sunburns to promote healing. According to folk medicine, it is ingested as a cure for constipation. It is found in many consumer products including beverages, skin moisturisers and cosmetics.